Bad, Ugly Orange (there isn’t anything good about them at the moment) have had a week to try and fix whatever they’ve done to their service. Tech support has been a joke of doing the same set of tasks that assume I’ve got a fault and refusing to actually run a line check. Since I’m out of contract I’m not going to hang around to see how much longer they take to get things working again. I’ve set a transfer in progress and I should be with a new broadband provider sometime next week. Till then I’m back using pay as you go dial up. It’s slow but it isn’t as slow as Bad, Ugly Orange which peaks at 1.03kBits/s but is averaging below 50Bits/s. I’ll be back online properly once the new connection is set up. 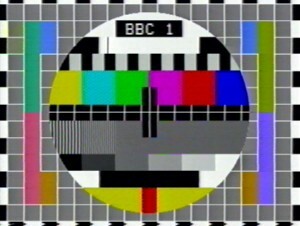 Until then I’ll leave you with a test card.